It’s been almost two months. Her number is still on a Post-it note beside my computer monitor. I can’t bring myself to take it down yet. Some days I drive home and wonder how she’s doing. I forget she’s gone, just for a moment, just long enough for it to ache when I remember. In every conversation with Mom, there’s a vacuum where the update should be. The argument with the nurse over how sandwiches aren’t a real lunch. The hunt for the earrings she hadn’t seen in years but wanted to wear tomorrow. The whole lobster she ate when they took her out to dinner. How tired she was. How her blood pressure danced up and down and made her dizzy. How she spent the entire day in her comfy chair because walking was getting too exhausting. Maybe I should have called more often. Her deafness frustrated us both and left us having parallel conversations with one side yelling to be understood and the other too proud to admit not understanding. But once she knew it was me, once I’d yelled my name three times with emphasis on different syllables in hopes one version would click, her voice would light up. I was her doll, her poupée, her first grandchild. It got harder to call, as her voice got weaker. It was frustrating. It was too hard to hear her talk about being tired, about how she thought she wouldn’t be here for Easter, or for Christmas, or for my next visit. It was so difficult to be reminded that she was 99 and each conversation might be our last. I didn’t call enough. I was selfish and scared and not ready. I’m grateful that we did get a last conversation, and that I wasn’t left with the pain and guilt of not having said goodbye. When Mom told me she was letting go, I called her room and her little sister, my great-aunt, answered. Her voice was so small and so sad. At 87, she was sitting next to her big sister’s hospital bed, holding her hand and singing to comfort her. She sobbed and apologized and couldn’t put the phone to Grandmaman’s ear for me. She can’t understand, she said. She’s too far gone and she wouldn’t hear me. I told her I understood. I thanked her. I hung up. I cried. When Mom got there, I tried again. She told her “C’est Jennifer,” and held the phone to her ear so I could tell her I loved her. I tried so hard to pour 34 years of love and memories and gratitude into those few seconds. She tried to respond but didn’t have the strength. But I imagined her hand, and I squeezed it in my mind. I’ve decided to believe that when she realized it was me, she squeezed back, 500 miles away, to say she loved me too. I can’t find the words, yet, to tell all the stories. There are so many stories. Both hers and ours. Her life; my memories. Driving us back from dinner during the break between the afternoon and evening viewings at the funeral parlor, my cousin turned down a side street and stopped the car in the middle of the road. It was dark and we were alone. The clicking of the hazard lights was the only sound as heavy snowflakes fell all around us. My brother, my cousin and I all looked up at Grandmaman’s old house for a silent minute. “It looks so small now,” one of us said. Fifteen years since she’d lived there, but it was still Grandmaman’s house to us. Home to memories of Christmases and card games and hide & seek and macrame lampshades. All of us in that car were adults, and yet we felt that we were sitting at the kids’ table. Until that week we were still the grandkids, still the younger generation. 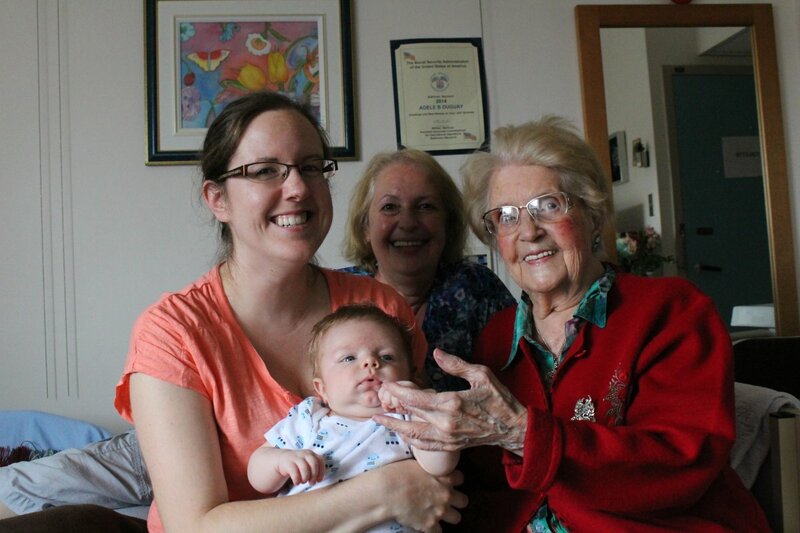 With Grandmaman’s passing, our parents suddenly seemed so much older. And that made us older, too. We weren’t ready. But I guess you never are. I’ll miss her so much. This entry was posted in Life and Family and tagged family, grandmaman, grief on January 14, 2015 by antijen. I would leave a few words for my grandchildren that I love so much. I begin by telling you that every day I pray for your happiness and success in all that you do. also good health. the rest will come. I appreciate very much all the attention that you give me. It is a real pleasure for me. I thank each and every one of you. I found this among her things and thought it appropriate to share here.